My blogging journey started in 2005 with a trip to Leh. Leh thus has an immense sentimental value for me! I re-visited Leh in January 2016! The winter flight to Leh was operated by GoAir. The trip in 2005 was a road trip. 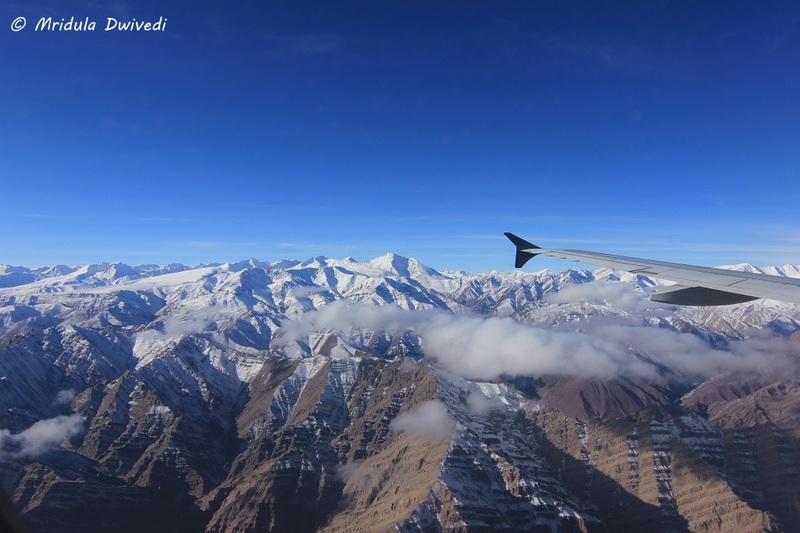 So this was my first chance to click the glorious mountains while landing at Leh! Like any good traveler I did my research. I was told that on a Delhi-Leh flight I should choose the A side window seat and the reverse while coming back! I opened the GoAir website punctually 24 hours before my flight so that I could choose a window seat at the web check-in. To my surprise even at that early hour all but one window seats were gone! But I got 30A the last available window seat, it would have to do! As I was flying in January, the airport was on high alert. Till the Republic Day is over security at the Indian Airports remains high. I am only stating this as a fact, I would rather deal with high security than with a breach of security! We were traveling in a big group, we were on invitation from the Hotel Grand Dragon. It took us ages to clear the security! Eventually I found my window seat in the plane. The plane was full of Ladakhi people going back home. There were only a few tourists going there in the bitterly cold weather. I initially thought the people sitting next to me were locals but I eventually realized that they were from Japan! I had a good flight, there was no turbulence. I bought a cup of tea in-flight and enjoyed it. The plane soon started its descent to Leh. I was now glued to the window! It was a mesmerizing panorama unfolding below me! As there was no luggage space left on, the rack I had kept my camera bag in front of the seat! Everyone had heavy woolens in their hand luggage hence the overhead compartments became full! I put the opportunity to good use, I took out my DSLR to click the pictures at the landing! The Japanese couple sitting next to me passed their camera as well. I was happy to click for them, they like the pictures! The Panorama at the Landing! As we got out of the plane, a gust of icy wind greeted us. The temperature was -3 degree Celsius. I had a down jacket and an overcoat in my hand luggage. I was doing fine. Even though Leh has become popular with the tourist, the airport is still basic. Even the doors were covered just with blankets! There was no real door. I wonder where all the tourism money is going! On my return flight, the hotel did the check-in and I got a middle seat! I sulk like crazy when I don’t get a window seat but with some good pictures on the landing, I decided to be more gracious about the middle seat, I only sulked a little! 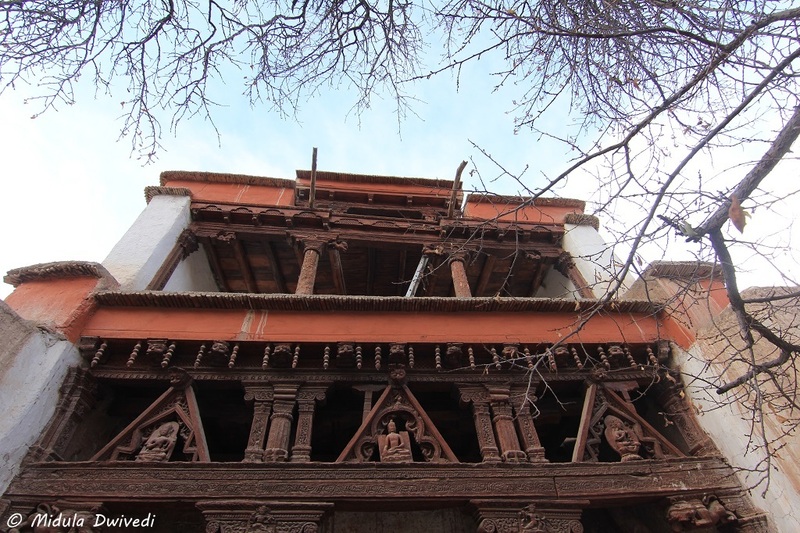 Before I visited Ladakh in January 2016, I had a million questions about going there in winter. 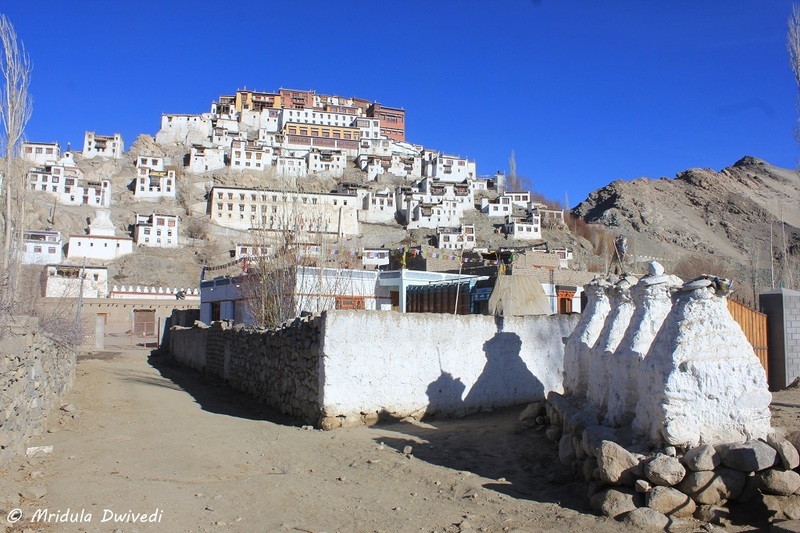 Now that I have been to Ladakh in winter it is time to write about my experiences. 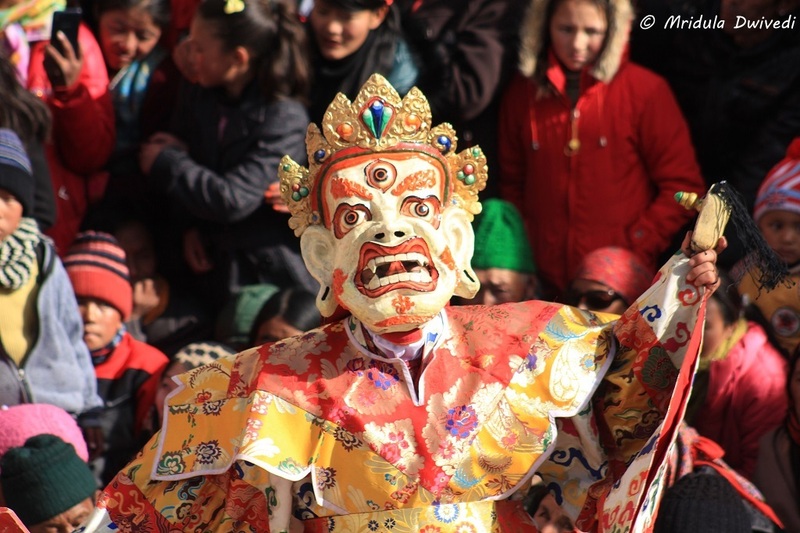 So here are the visiting Ladakh in winter FAQs answered. If I have missed out on something do ask in the comments section. Q. 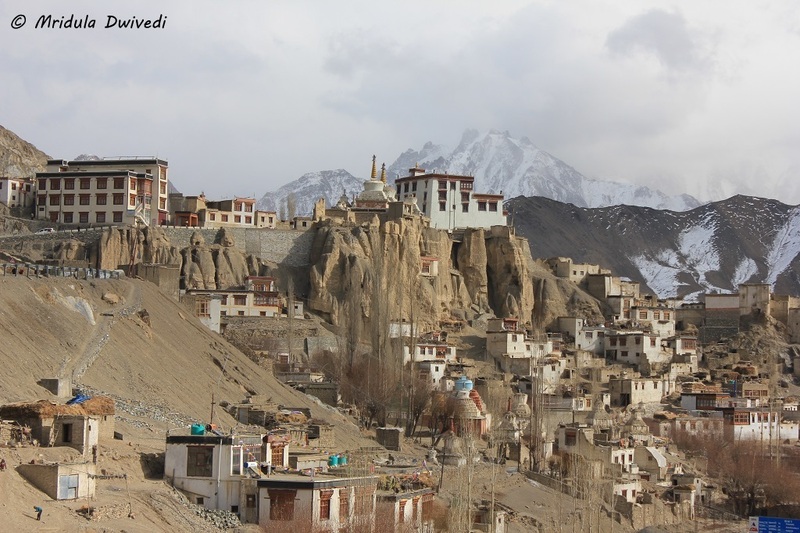 What is the temperature like in Ladakh in Winters? 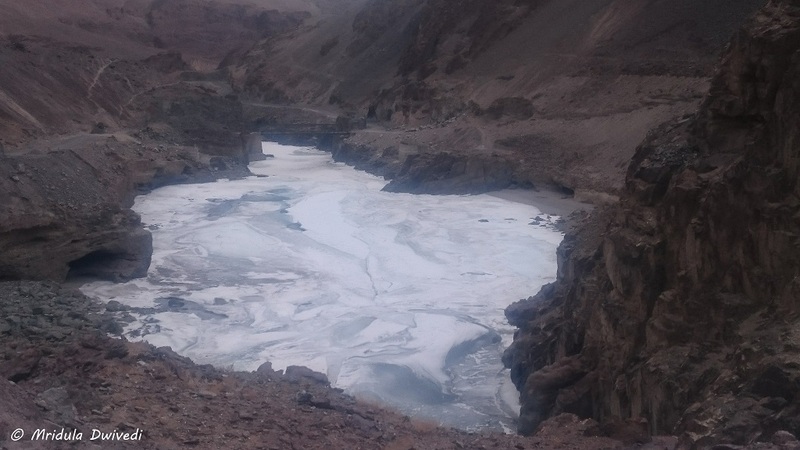 The Frozen Zanskar River in Winter, it is that Cold! A. It is cold, it is very very cold. It feels very cold. It is cold in every way imaginable? I hope I have made my point very clear that it is cold. How cold exactly you ask? When I landed at Leh it was -3 Degree Celsius. 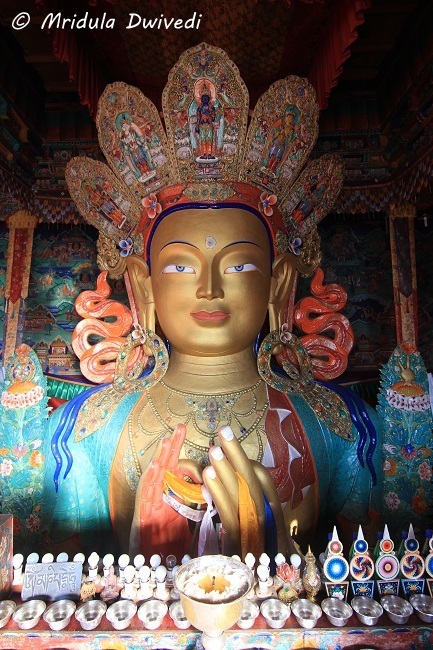 I visited Ldakh from January 6 to January 10 2016. Most of the time the weather apps showed a temperature in minus. I did see 5 degrees once but with wind even that felt cold. 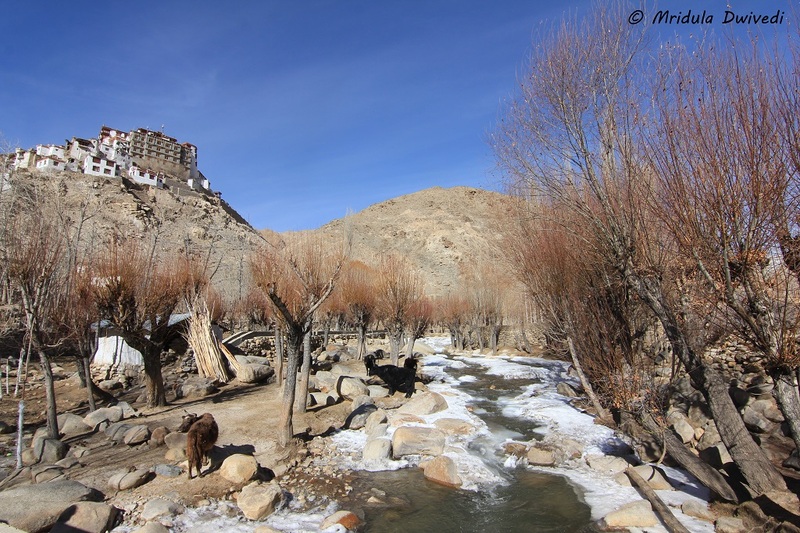 To sum it up winters in Ladakh are bitingly cold, there is no other way to describe it. It is cold, cold damn cold. The coldest that I saw with my own eyes was -15. The various weather apps in your phone or a simple search on the web will give you a more accurate answer. I am just corroborating it as a human being! The apps are not lying. Q. 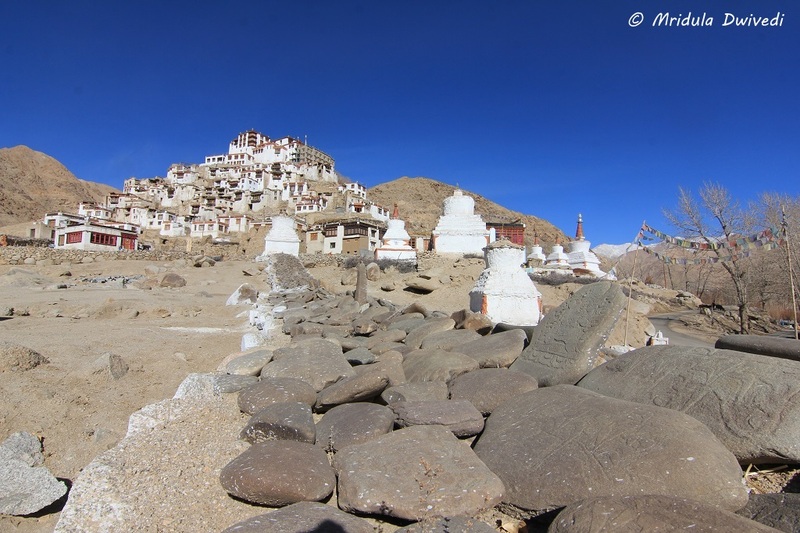 So why should I go to Ladakh in Winter? Near Chemdey Monastery, Ladakh in Winter! A. That is an excellent question. You ought to get your head examined if you wish to go Ladakh in winter, but then you already knew this. You came Googling your way to this post! 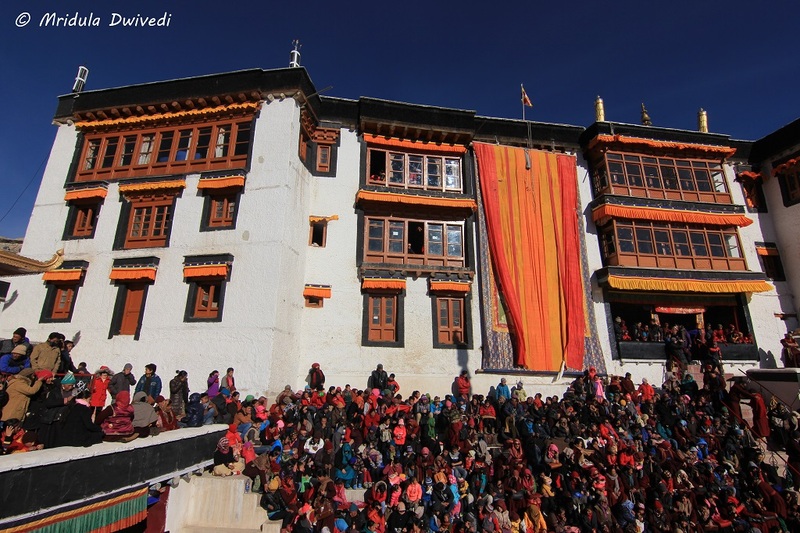 So even though it is bitingly cold you somehow want to go to Ladakh in winter. Welcome to the club! I first went to Ladakh in 2005. I call it the ‘pre 3 Idiots era’. There were people but it was not maddening. You could have gone to Ladakh in summer then. But I am told that summer in Ladakh is now a show! Anyone and everyone wants to be there. To me it sounded like a small kumbh mela! Ladakh in winter is quiet. The landscapes are surreal, the festivals are attended by locals, you will have to search for tourists hard. And you can have the whole place to yourself! I went to Ladakh now after 10 odd years and people tell me I should thank god that it was winter! Q. OK so I am worried about cold, should I be worried about the altitude too? A. Ladakh is at the height of 11,500 feet which is quite high for us, mere mortals, who live at the sea level. At that height there is less oxygen in the air. You need to be aware of High Altitude Sickness. I have talked about it before but then I am no authority. I acclimatize without Diamox but everyone is different. Your doctor is an authority. Consult your doctor if you have any doubts. Consult your doctor anyway if it is your first time at a high altitude. Read about high altitude and how it affects human body. It will help you in dealing with your experiences at high altitude. Also, this applies to anyone who is going to Ladakh in summer as well. The one advice that everyone will give you about traveling to high altitudes, be it Ladakh or anywhere else, is to take it slow for the first few days. I add my insignificant weight to that advice, do take it slow on the first few days. Q. How do I reach Ladakh in Winter? A. 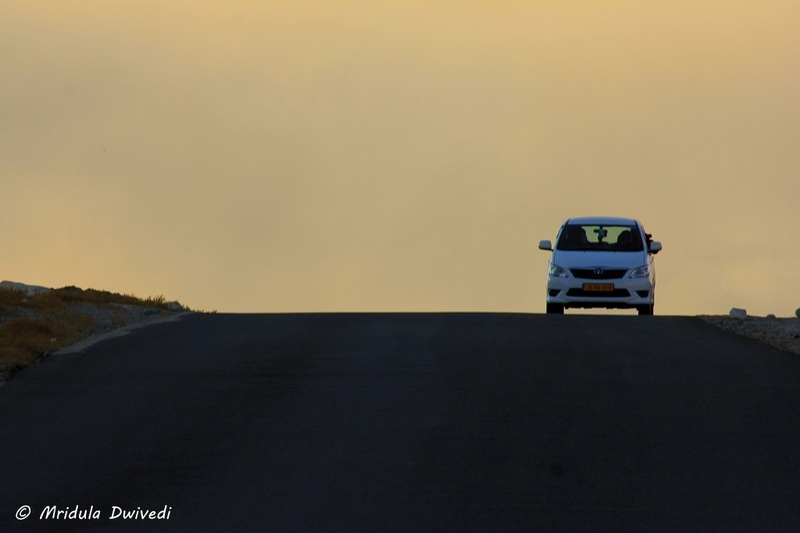 The Manali-Leh road route closes out around October. The Srinagar- Leh route closed in early January this year, I was told. 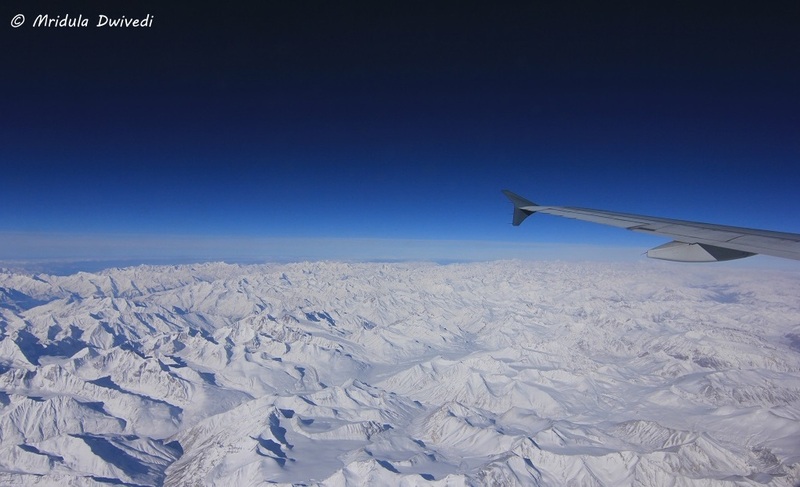 Flights are the easiest way to reach Leh, in winter. I have done the Leh Manali route in 2005. I have been to Spiti by road three times. 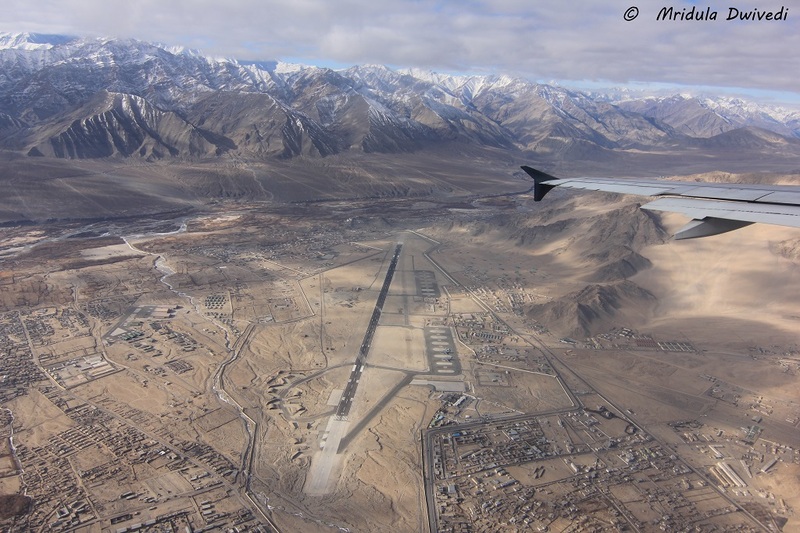 I flew into Leh this winter and it was a first. I still acclimatized well after taking the flight! I would say with the flight, I was not so tired as well as I am with the road journeys. If you ask me, catching a flight is your best bet to reach Ladakh in winters. I took a Go Air flight. Air India flights were also available. Q. What kind of clothes do I carry to fight off the cold? 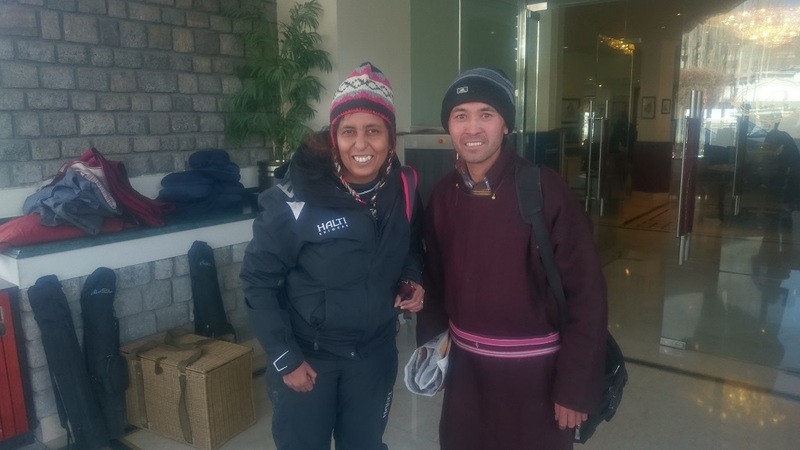 Trying to Stay Warm in Ladakh- Tashi’s Dress was Much More Stylish than Mine! A. 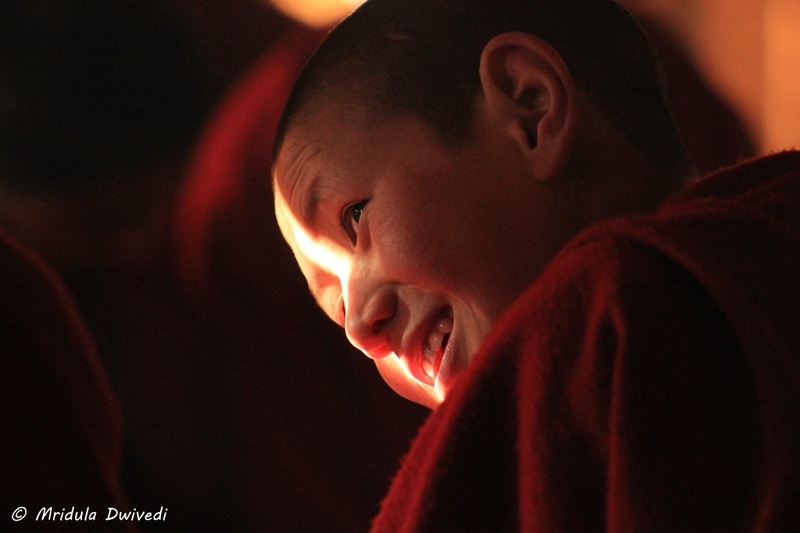 You carry heavy woolens to Ladakh and hope and pray that they would be enough. I hate wearing caps but I would not dream of visiting Ladakh without them. I hate gloves, but I wear them religiously in Ladakh. I avoid my trekking shoes like plague when I am not trekking, but I took them to Ladakh in winter even though I was not trekking. They were the only shoes I carried. I had the good fortune of visiting Finland in 2014. It was an event organized by Nokia. The good hosts gave us gear to wear in that Arctic temperatures. It was -22 in Lapland when we landed at Kittila. I used the thermals and the ski gear they gave me in Finald to fight off the cold in Ladakh and I did fine. So get out your warmest gear, buy some new ones if you don’t have much. Wearing layers helps in combating cold. Start with cotton so that the body is comfortable. Wear thermals, wear thick woolen socks. And then wear more layers, topping it off with your heaviest down jackets. And then pray that it should not be windy. Wind chill is the worst thing, be aware and be prepared. Also when you are visiting monasteries you would be removing your shoes. Remember to wear thick woolen socks or the cold will make you dance when you keep your feet on the floor! Q. 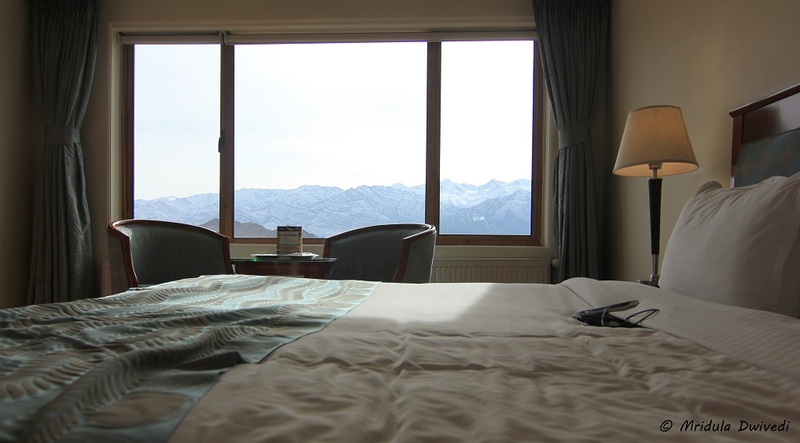 Where to Stay in Ladakh in Winter? The Centrally Heated Room was a Bliss! A. I stayed at the Grand Dragon Ladakh but my trip was sponsored by the hotel. The hotel is centrally heated, it has 24 hour hot water. It helps a lot for the cold winters. But then I am sure a good homestay will keep you warm too though not in the style of a star hotel. Do research your stay options wisely and please prepare accordingly. Q. Will the taxi be heated? A. Most of the taxis in Leh would be heated. If in doubt do ask and insist on one that is heated. 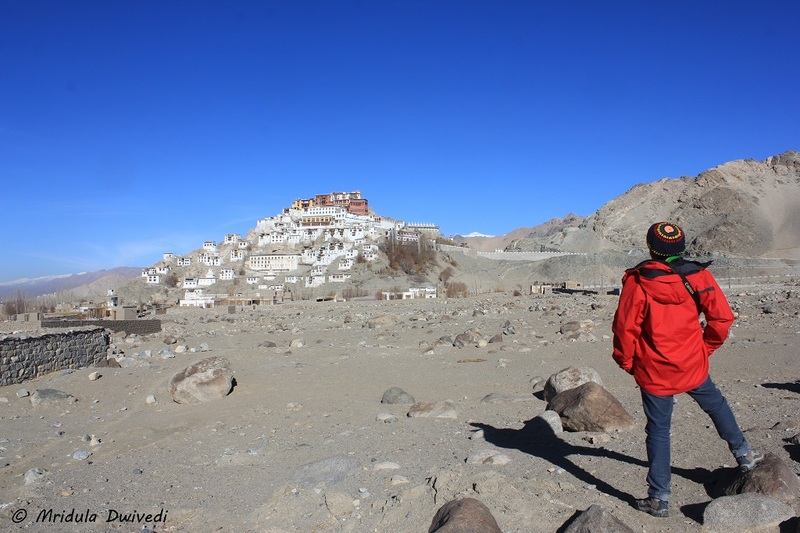 Q. I do not want to trek, is there anything else I could do in winter in Ladakh? A. 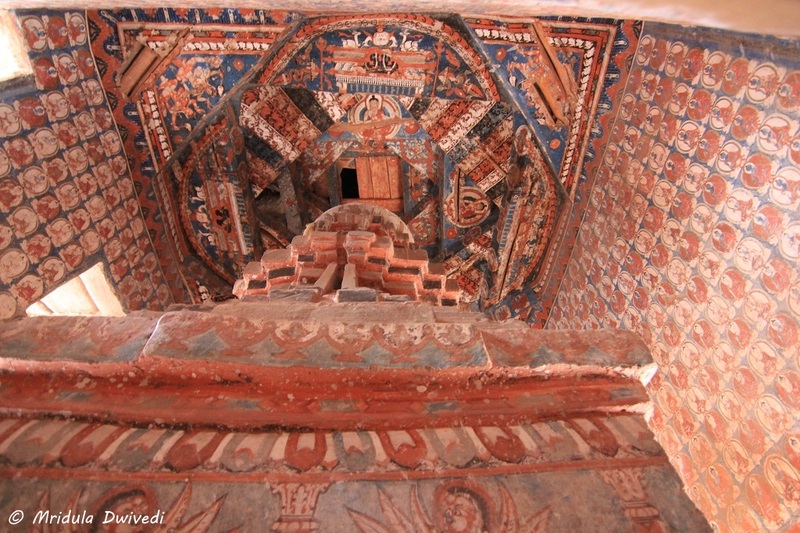 There is plenty to do in Ladakh even if you do not wish to trek. 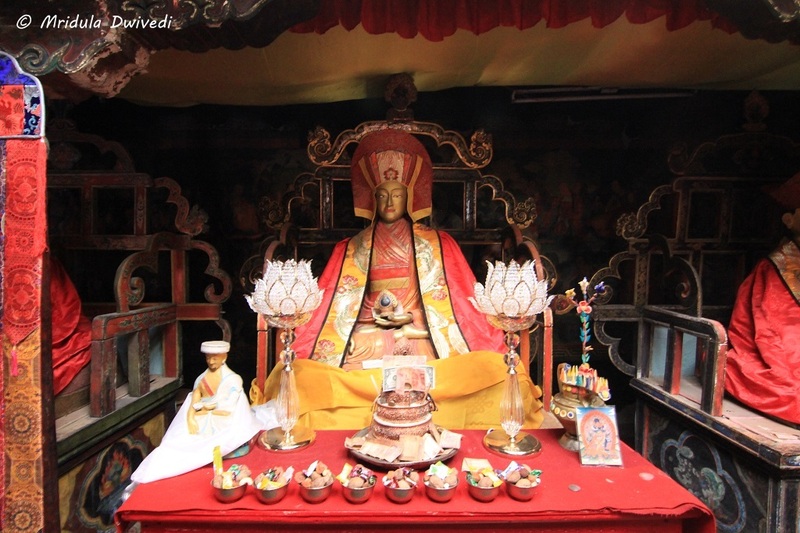 We attended the Gustor Festival at the Spituk Monastery. We visited Chilling, Alci, Lamayuru, Thiksey and Chemdey. All the roads were open. We could not go to Chilling all the way as BRO was blasting on the road. But other than that we had no problem. Q. Where do I get Food? 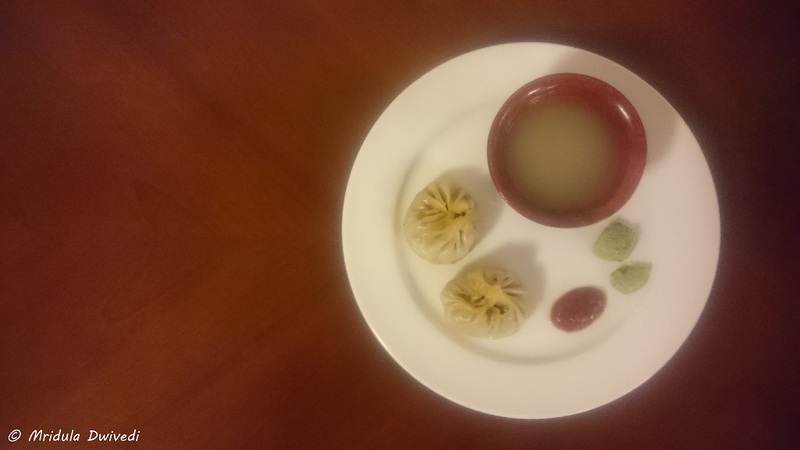 Momos and Chang- Such Bliss! A. As most of the hotels and restaurants shut down during winter in Leh, your hotel/guesthouse/homestay is your best bet for food in winter. Q. Should I Really Go? A. Go watch the video and tell me that you can resist!